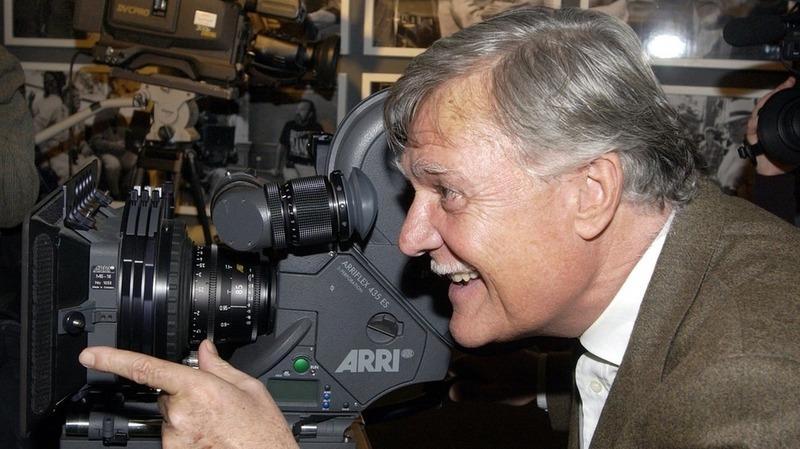 German cinematographer Michael Ballhaus, most famous for his collaborations with the auteurs Rainer Werner Fassbinder and Martin Scorsese, passed away today at age 81. Here are scenes from eleven films (because ten just aren’t enough!) photographed by Ballhaus, unforgettable moments that are forever imprinted in my mind. Beware of a Holy Whore (1971, dir. Rainer Werner Fassbinder). An unhappy actress is fired from a film project after making too many demands; we watch her departure in an extended take that Ballhaus shot inside the boat taking her away from the set. I love the blueness of the water and the soft, golden light on Magdalena Montezuma’s face as she drifts further and further away as an aria from Donizetti’s Lucia di Lammermoor plays on the soundtrack, before we are abruptly brought back to a scene of the film shoot. Perhaps Fassbinder’s choice of aria, “Il dolce suono,” which depicts the aftermath of Lucia stabbing her husband to death on their wedding night and subsequently fantasizing about marriage to a different man, is applied to Magdalena Montezuma’s farewell scene (trust me, she exhibited tremendous histrionics) by implying that after the bout of madness that destroyed her career opportunity, she can still dream of a brighter future, even if it’s one that probably won’t happen. The Bitter Tears of Petra von Kant (1972, dir. Rainer Werner Fassbinder). In the first video, Michael Ballhaus discusses his work on Petra von Kant in an interview conducted by the Criterion Collection for a new DVD release of the film in 2015. In the second clip, we see a scene showing the beginning of the first romantic encounter between fashion designer Petra (Margit Carstensen) and a young protégée, Karin (Hanna Schygulla), who is willing and eager to sleep her way to the top of the modeling world. The ornate costumes were designed by Maja Lemcke, her only film credit according to the IMDb. Martha (1974, dir. Rainer Werner Fassbinder). One of Fassbinder’s greatest films was produced for TV, a melodrama in the style of Douglas Sirk titled Martha. Margit Carstensen plays the main character, a young woman whose father (Adrian Hoven) dies while they are on vacation in Italy; on the same fateful day, she falls in love with an older man (Karlheinz Böhm), whom she soon marries (with disastrous consequences for her). Fassbinder introduces Böhm’s character and shows the instant attraction in the pair’s first meeting thanks to Ballhaus’s cinematography. The camera rotates hypnotically around the man and woman, a dizzying vision of lust. You’ll also note that the scene ends on a shot of a voyeuristic interloper played by El Hedi ben Salem, who played the male lead opposite Brigitte Mira in Fassbinder’s All That Heaven Allows remake, Ali: Fear Eats the Soul, that same year. Salem was Fassbinder’s on again, off again boyfriend in the 1970s and he eventually committed suicide in a French jail in 1977, having been arrested and convicted of stabbing three people in a bar fight. Fox and His Friends (1975, dir. Rainer Werner Fassbinder). Possibly Fassbinder’s greatest masterpiece, Fox and His Friends is the tragic tale of Franz, a working-class man (played by Fassbinder) whose naive, guileless affection for his wealthy boyfriend, Eugen (Peter Chatel), allows Eugen to manipulate and exploit him. In one memorable segment of the film, Eugen convinces Franz to go on a pleasure trip to Morocco, where the couple pick up a local “guide,” Salem (the aforementioned El Hedi ben Salem). The cinematography in the scene in which Franz and Eugen cruise the “Meeting Place of the Dead” is exquisite, decorating the landscape in bars of light from the wooden slats above the market. Mother Küsters Goes to Heaven (1975, dir. Rainer Werner Fassbinder). Although this clip does not have subtitles, all you need to know is that a cabaret’s emcee (Peter Kern) excitedly introduces a singer’s act (Ingrid Caven), while her new boyfriend (Gottfried John) and her embarrassed mother and brother (Brigitte Mira, Armin Meier) look on. The family considers the performance quite tasteless, given that the family’s patriarch has recently committed suicide; even in the face of personal tragedy, the daughter is too vain and hungry for fame to consider postponing her stage show. Fassbinder loved images of people experiencing shame, frustration and other variations of pain, and this scene is no exception. Chinese Roulette (1976, dir. 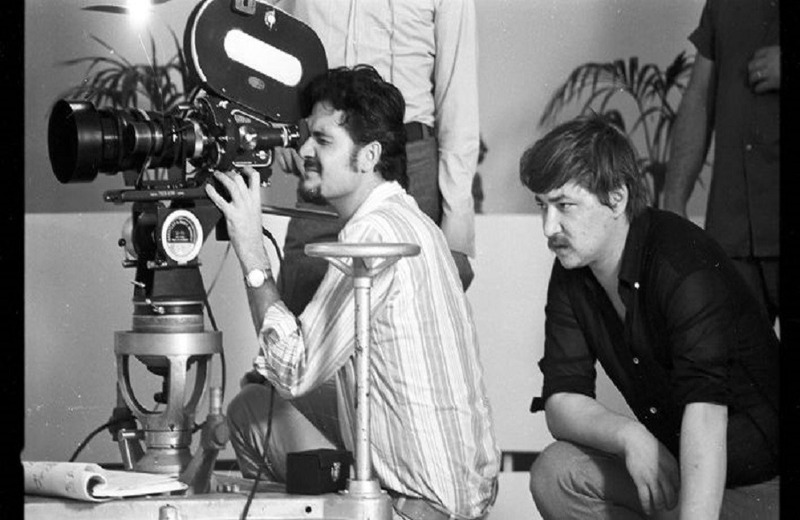 Rainer Werner Fassbinder). Alexander Allerson and Margit Carstensen, playing an estranged husband and wife, embrace in a scene depicted magnificently in one long dolly shot revolving around the two actors. Without dialogue, we get an intense feeling of intimacy from the swirling motions of the camera and the images of the performers’ faces, especially the expressive Margit Carstensen (one of Fassbinder’s favorite leading ladies). After Hours (1985, dir. Martin Scorsese). Paul Hackett (Griffin Dunne), a word processor who works for a publishing firm in Manhattan, experiences the worst night of his life after he meets an unusual young woman, Marcy Franklin (Rosanna Arquette), in a diner. As the two talk in Marcy’s apartment, Ballhaus keeps the scene minimally lit, but he zooms in on Arquette’s face when she leaves the room, a typically Scorsesean shot which is my favorite in the entire film. Broadcast News (1987, dir. James L. Brooks). Television producer Jane Craig (Holly Hunter) leads news anchor Tom Grunick (William Hurt) through his first live show, a relationship that relies on her ability to direct his “performance” – a role-reversal of the Svengali and Trilby archetypes. 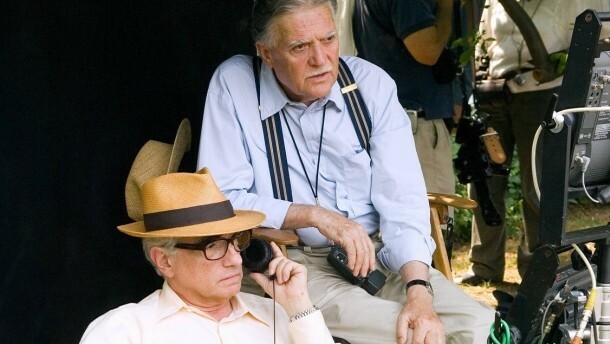 Michael Ballhaus nicely conveys the depth of the TV studio, showing the distance and shifting perspectives of characters in the control room and down on the set. Goodfellas (1990, dir. Martin Scorsese). One of the most celebrated scenes in the history of Martin Scorsese’s career is the unedited shot of mobster Henry Hill (Ray Liotta) and soon-to-be wife Karen Friedman (Lorraine Bracco) entering the Copacabana nightclub by way of the kitchen, a handheld shot achieved with the use of a Steadicam. The scene was shot eight times; reportedly, the eighth take is what Scorsese put in the finished film. Bram Stoker’s Dracula (1992, dir. Francis Ford Coppola). Enjoy the lush visual atmosphere of Coppola’s Dracula set: the lighting by Michael Ballhaus, Gary Oldman’s dedicated performance as the title vampire and Winona Ryder’s underrated work as Dracula’s great love, Mina Murray. The beautiful score composed by Wojciech Kilar completes the picture. Quiz Show (1994, dir. Robert Redford). One of my favorite moments in Quiz Show is the scene in which Charles Van Doren (Ralph Fiennes) comes close to revealing to his father, Mark (Paul Scofield), that he has been cheating during his winning streak on the TV quiz show Twenty One. Charles cannot bring himself to admit the sordid truth, though, and the cinematography reflects the metaphorical darkness weighing on Charles’s mind by displaying Mark Van Doren’s private study drenched in shadows. Michael Ballhaus’s use of close-ups, especially as Charles dances on the edge of revealing his secret, draws you in closer to the drama, but I also love the wide shot that the scene ends on, explaining without words that the brief window of opportunity for Charles’s confession has passed.